Click here (PDF 55KB) for a PDF version of this page. 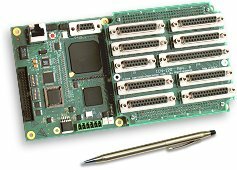 At the heart of PMC's MultiFlex ETH 1000 Series motion controllers is a powerful and flexible hardware platform that can be adapted to a multitude of applications. Because of the generous processing capacity, memory and I/O available, PMC can readily add significant features and performance enhancements to meet the unique needs of specialized OEM applications and deliver highly optimised solutions at a fraction of the cost of competing controllers.